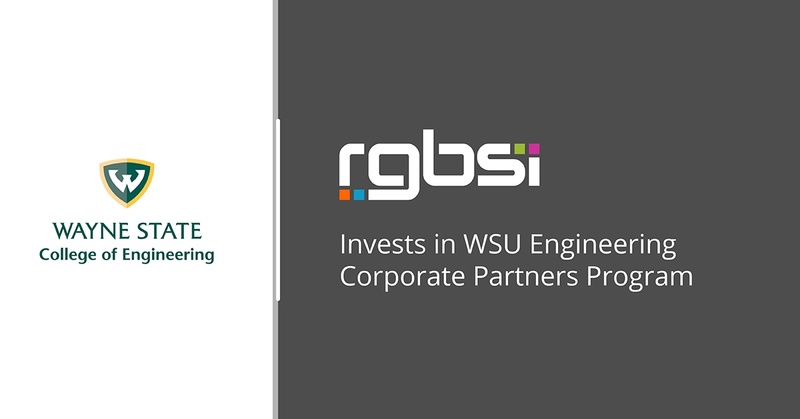 RGBSI is proud to invest in the Wayne State University (WSU) Engineering Corporate Partners Program (CPP). The goal of the program is to involve highly influential engineering companies in the best alignment of educational curriculum with today’s engineering job requirements. RGBSI’s contribution will support the continuous advancement of WSU’s engineering education in the high impact practices of experiential learning, global experience, undergraduate research, hands-on experience, and community engagement. It is a privilege for RGBSI to have an impact on WSU’s engineering curriculum through its own practical experience in solving R&D and product design & development challenges. The disciplines of engineering continue to evolve as new technology and methods are adopted by organizations. This requires future engineers to meet the progressive engineering practices of the corporate world. The CPP ensures engineering students are equip with applicable industry knowledge upon entering the workforce. In RGBSI’s partnership with CPP will open doors to hands-on experience through engaging learning opportunities to advance engineering programs. As a company, it is important to remember the foundation of engineering success starts with education. It is our duty to ensure educational programs have access to modern technology, resources, and experiences that prepare future engineers for the real world. WSU Engineering CPP prioritizes the quality of education through raising the expectation of curriculum standards. By leveraging industry experts like RGBSI, WSU can assimilate modern engineering practices in the classroom. RGBSI’s investment will have strategic impact on the long term quality of education at WSU College of Engineering. RGBSI delivers workforce management, engineering, quality lifecycle management, and IT solutions that provide strategic partnership for organizations of all sizes. As experts across key engineering disciplines, RGBSI delivers engineering solutions that optimize the value chain, meet industry protocols, and comply with full product specifications. The company’s extensive portfolio demonstrates its commitment to delivering all types of advanced engineering solutions to fulfill client needs. RGBSI is ISO 9001:2015 and AS9100:2009 Rev C certified, as well as a Minority Business Enterprise. Learn more about RGBSI Engineering Solutions.